The new version of the Windows server operating system from Microsoft - Windows Server 2019 - has already been released and is being actively used now. It has many innovative features for working with a hybrid cloud, security, application platform, and hyperconverged infrastructure (HCI). In Windows Server 2019, the new functionality (Storage Migration Service) and extended one (Storage Spaces Direct and Storage Replica) have been included in the storage technologies. 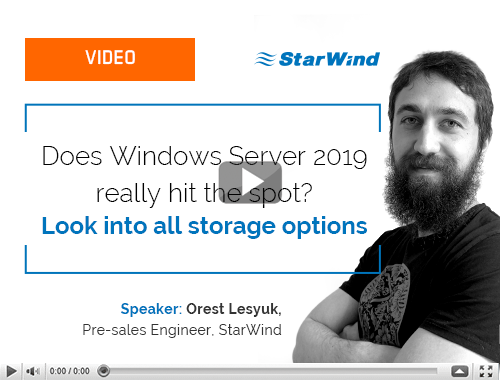 Find out from this video about the new and changed functionality in the work of storage and what advantages you can get from working with Windows Server 2019. Remote Direct Memory Access (RDMA) is a technology that allows computers in a network to exchange data in main memory without involving the processor, cache, or operating system of either computer. By freeing up resources, RDMA improves throughput and performance, facilitates a faster data transfer rate and low-latency networking. Find out from this video about an RDMA technology, its implementations, advantages and disadvantages, ways to use and configure an RDMA connection. Today more and more companies are expanding beyond the single location. A stretched cluster allows the companies to keep their data safe across several geographical locations and in case of any emergencies. It combines servers into a single system, providing high availability (HA) and load balancing and giving an opportunity to migrate VMs easily from one place to another. 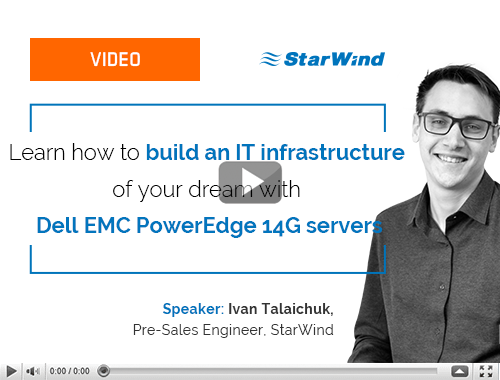 Find out from this video about a stretched cluster differentiation, replication options for it, different deployment scenarios, ways to secure data and prevent split brain. When managing a virtualized environment, the main task of a Windows Infrastructure Administrator is to spend minimum time with maximum efficiency. When it comes to Hyper-V infrastructure, Microsoft provides a number of tools that help system administrators to get the job done: RSAT, PowerShell, 5nine, WAC, and SCVMM. 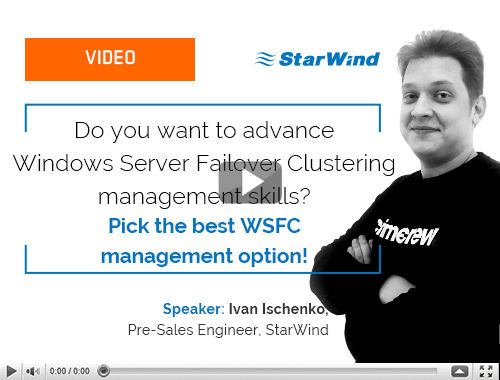 Find out from this video about the pros and cons of each Windows Server Failover Clustering (WSFC) management option and choose the best for you. VMware environment allows you to run, connect, and manage many applications. But sooner or later the question arises of the need to guarantee data safety and constant applications availability. 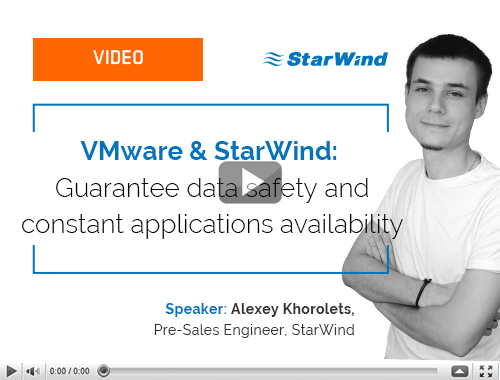 Find out from this video how to configure highly available (HA) and fault tolerant (FT) VMware environment with StarWind VSAN for vSphere deployment.